Birkby House bride and bridesmaids. A combination of heirloom flowers and Hydrangea for a soft style. Photography by Kate Elizabeth Photography. Hydrangea has been one of the bridal world’s most popular flowers. It has an easy romantic charm, gorgeous texture and the ability to create wonderful fullness in arrangements and bouquets. For many years, Hydrangea was one of the leading ladies and could be found in bridal and bridesmaid bouquets, centerpieces, altar arrangements and on arches. As the industry moves toward more color and space between blooms, Hydrangea seems to be taking on a “best supporting actress” role. One of our designers snapped this photograph during set-up at the Washington Golf and Country Club. There are two important factors that determine whether Hydrangea will have a place in your wedding: personal taste and budget. Many brides and flower lovers remain head-over-heels for many of its varieties. We had two weddings this past weekend in Northern Virginia: one in a country club ballroom (Washinton Golf and Country Club) near DC and the other at the historic Birkby House in downtown Leesburg. The ballroom was glamorous with candles and soft pin-point lights above every table. The historic home and garden, picturesque, with a charming tent and a "take me away" feel. 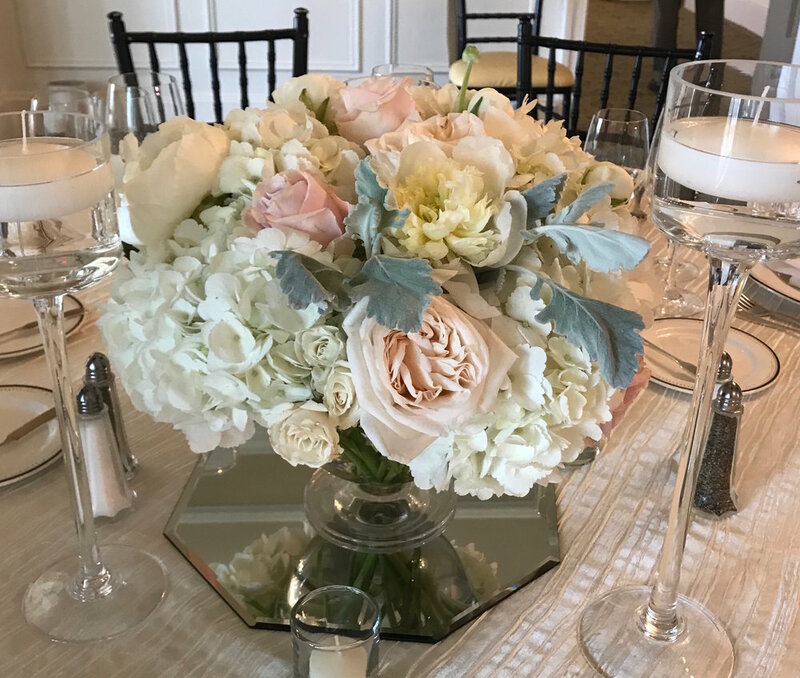 The ballroom centerpieces were rounded in shape with White Hydrangea, Peonies, Garden Roses, Spray Roses and Dusty Miller, some low, some high, in muted shades of ivory, pale pink and blue. The bride carried Peonies only in her DC wedding but used the Hydrangea in her centerpieces to get a full, rounded look. The Birkby House wedding included Hydrangea as well and yet we created a very different style. The bride carried Peonies, Garden Roses, Succulents and Eucalyptus in a loose more gathered style. 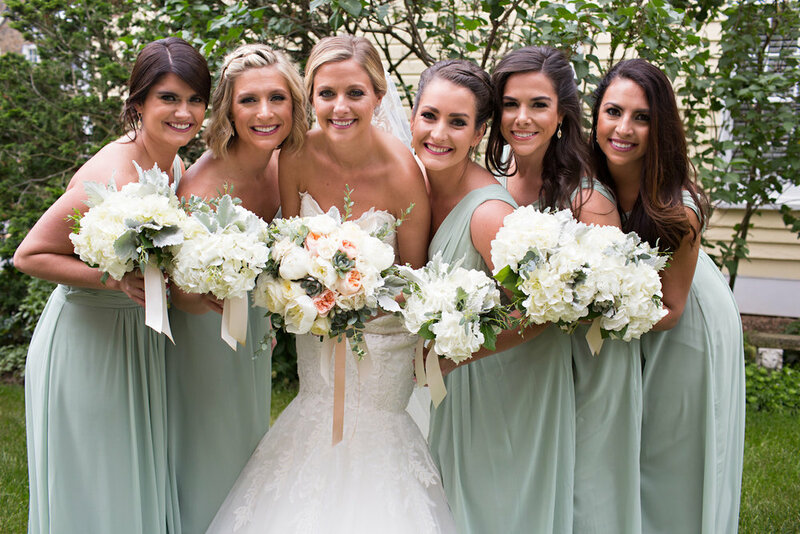 The bridesmaids carried only Hydrangea with Eucalyptus and Dusty Miller. We used these greeneries to create leggy-ness and a looser feel to match the bridal bouquet style. 1. Some varieties are very affordable. Purple Hydrangea at Oatlands Historic Home and Gardens, photography by Tony J. White Hydrangea is the least expensive variety and yet this is no reflection of the quality of the bloom. It’s just simple supply-demand economics. White Hydrangea is easy to grow and is grown locally by our wholesalers. The colorful varieties get more expensive with the rarest combination of colors available for can as much as $8 to $10 more per stem wholesale. 2. They come in some unique and sometimes hard to achieve colors. Blue (need I say more), purple, pink, antique pink and green, mini-green, purple and rarer color combos with tinted edges. We think about the most traditional colors but as your floral designer about some of the other varieties. 3. They add fullness, size and a rounded shape. Rounded shape so easily created with Hydrangea with some focal point blooms. Photography by Eli Turner. Hydrangea is a great filler for tall centerpieces that need to appear large over the table, but they also fill a wooden box staged with some of your focal flowers. They can stand alone in a smaller vase as an accent piece. Hydrangea naturally creates a rounded shape. We can one or two small ones to your loose, gathered bouquet without loosing that whimsical shape, but they really are perfect for the timeless textured, rounded bouquet. 4. They are a perfect flower for a mix-and-match wedding. Dahila and Roses nestled among Hydrangea. Katelyy James Photography. This is the best part. You can use luxury flowers like Peony, Dahlia, Anemone and Garden Roses in important parts of your wedding like bouquets and centerpieces and then fill in with beautifully textured Hydrangea. Additionally, Hydrangea adds volume to your arch allowing us to incorporate a few of your signature blooms while creating impact. Simply put, Hydrangea is a great way to get more from your budget. And, it is so versatile and not just for weddings. We use white, blue, mini-green and antique Hydrangea in quite a few of our designs for retail purchase. It's a great flower for you to use at home in your own vases and containers. Remember to cut the stems at an angle and take small steps when analyzing the stem. You can always cut more, but you can never go back. Use the floral preservative packet that you get from your grocery store to add life to your flowers. A few stems in a vase will dress up your table and take about five minutes of prep time.